I thought the bad luck of Friday the 13th -- trapped in the subway for an hour and then my oven burst into flames when I finally got home -- was behind me. But no such luck. See example A, above. These are supposed to be doughnuts. The round ones, with holes in the center. I made these on Father's Day when the chocolate cake that was supposed to be our dessert didn't arrive. 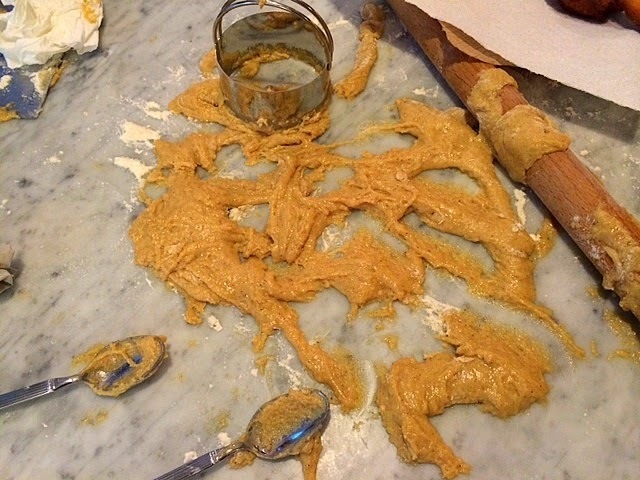 The DS's girlfriend, who is a fantastic cook and baker, had her own kitchen disaster in the form of a failed cake. A work colleague is blaming Mercury being in retrograde for all manner of things going wrong. And I do think he's right. 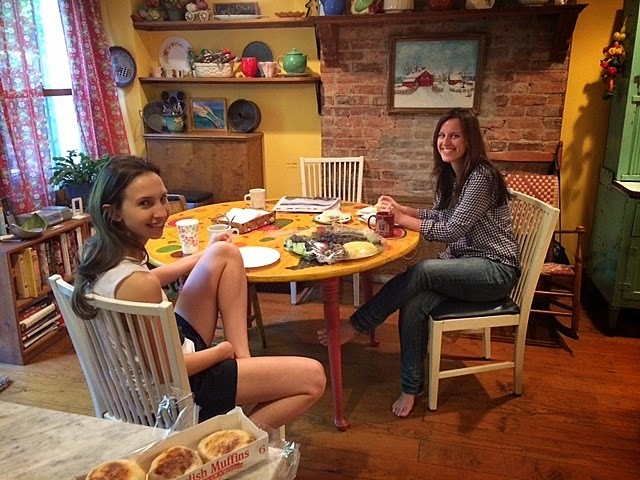 Having said all this, these doughnuts tasted pretty good. 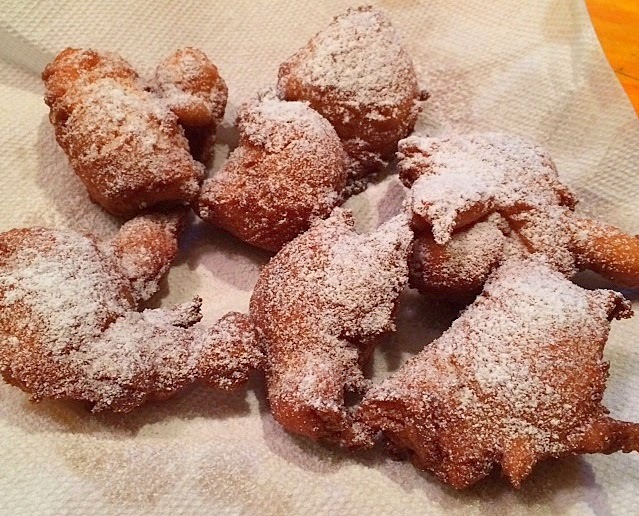 Just say they're zeppoles or beignets when you serve them, and no one will be the wiser. This was my first attempt at doughnuts. 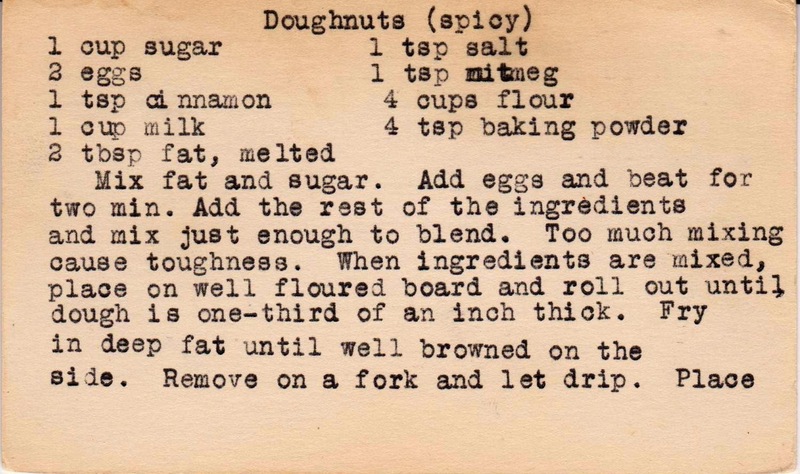 Homemade doughnuts are such a thing of the past, that I figured vintage recipes (this one is probably from the 1930s or so) would be perfect. But no. 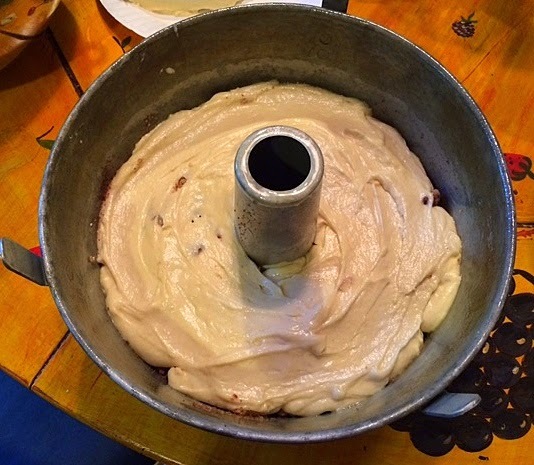 I thought the hard part would be the deep frying, but instead it was the batter. It was easy to put together, but because of my lack of experience (and common sense), I didn't realize that it wasn't stiff enough to roll out and cut into doughnut shapes. 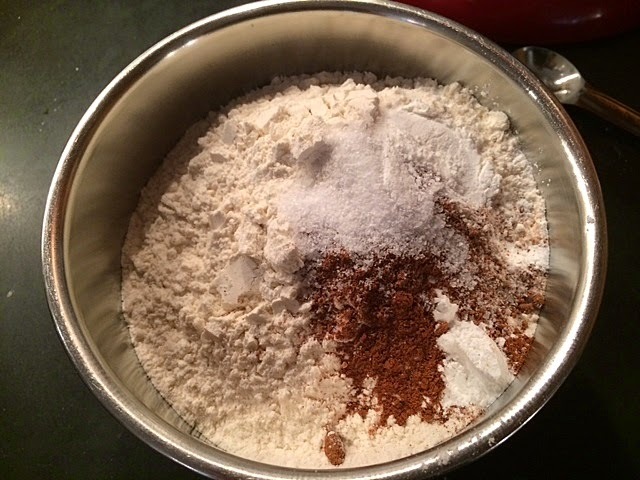 It needed more flour to achieve the right consistency. 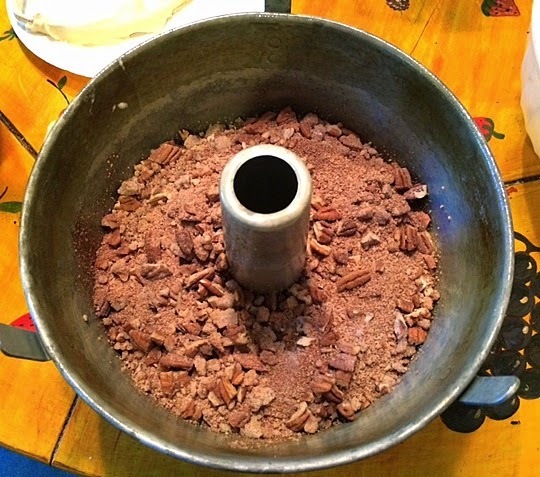 The dry ingredients: flour, salt, cinnamon, nutmeg and baking powder. 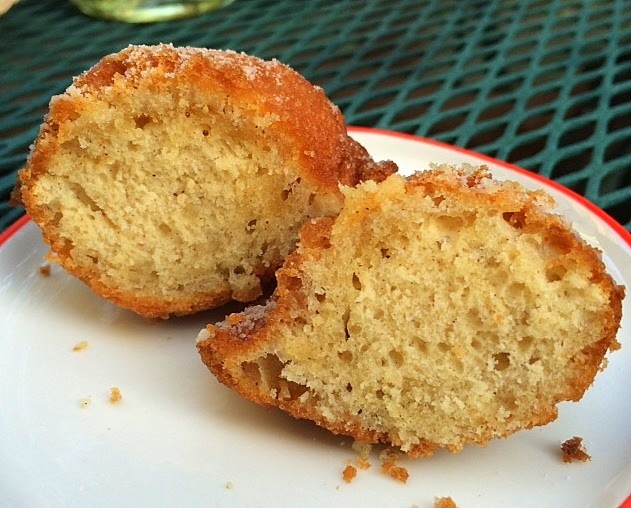 These are cake (not raised or yeast doughnuts) so they can be made quickly, i.e., no rising time. 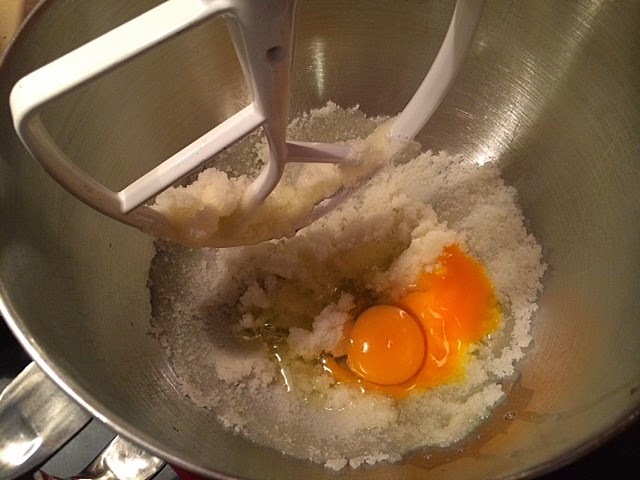 Eggs, sugar and butter are mixed together, and the dry ingredients are added to this mixture, alternately with a cup of milk. 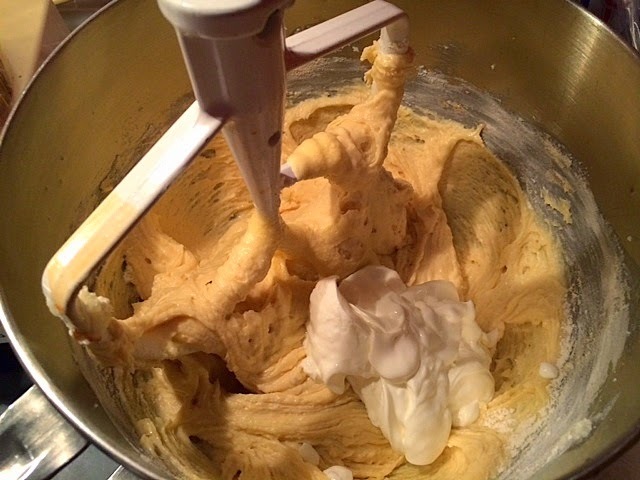 The too-soft batter. I should have added more flour at this point. I tried to add flour here, but it was too late. 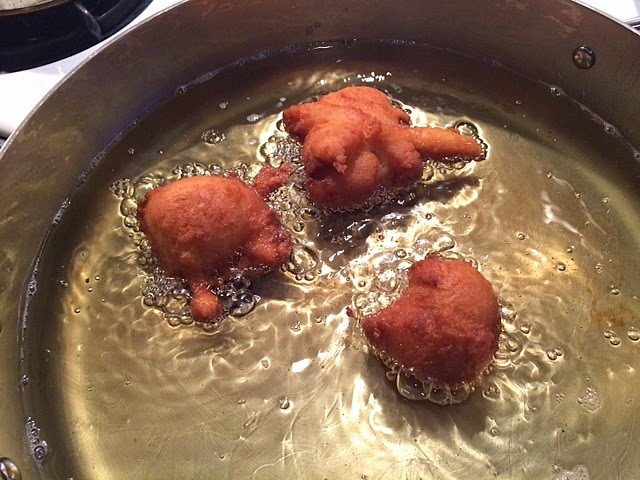 When I was unable to cut out the doughnut shapes, I just used two spoons to drop the batter into the hot oil. Frying these was actually kind of fun. Because these don't have the holes, they need to fry a bit longer. 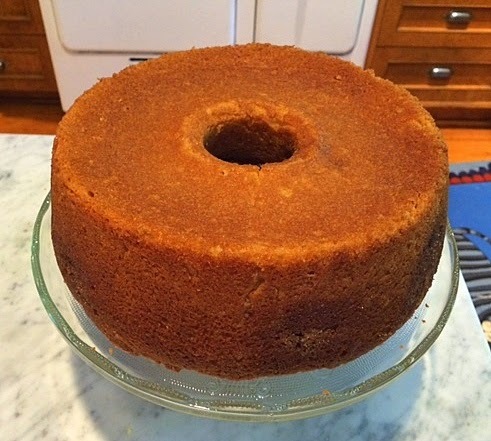 The first batches I made were perfectly cooked inside; subsequent batches (I realized after passing a plate over the garden wall to my neighbors) may not have been cooked through. 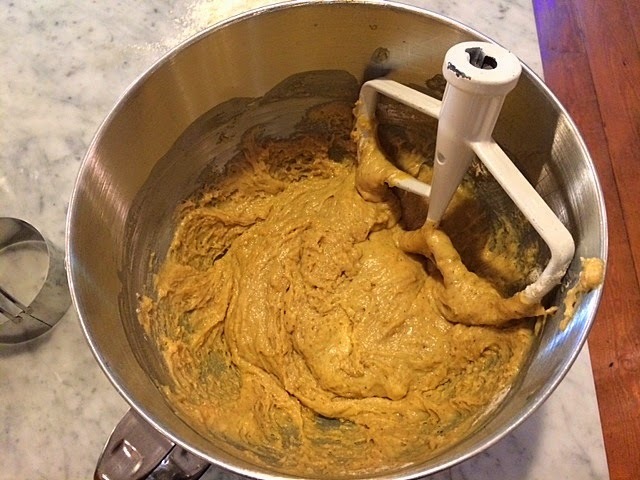 I happen to love raw batter, but it may not be to everyone's taste. 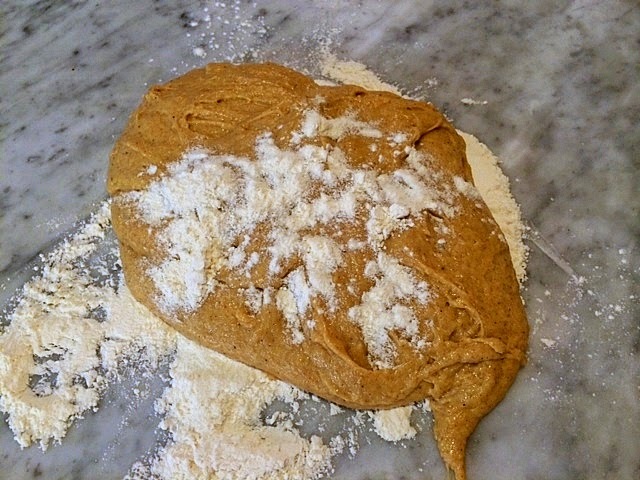 Production notes: Add enough flour to make a dough stiff enough to roll out! These are not very spicy (as the vintage recipe card says). 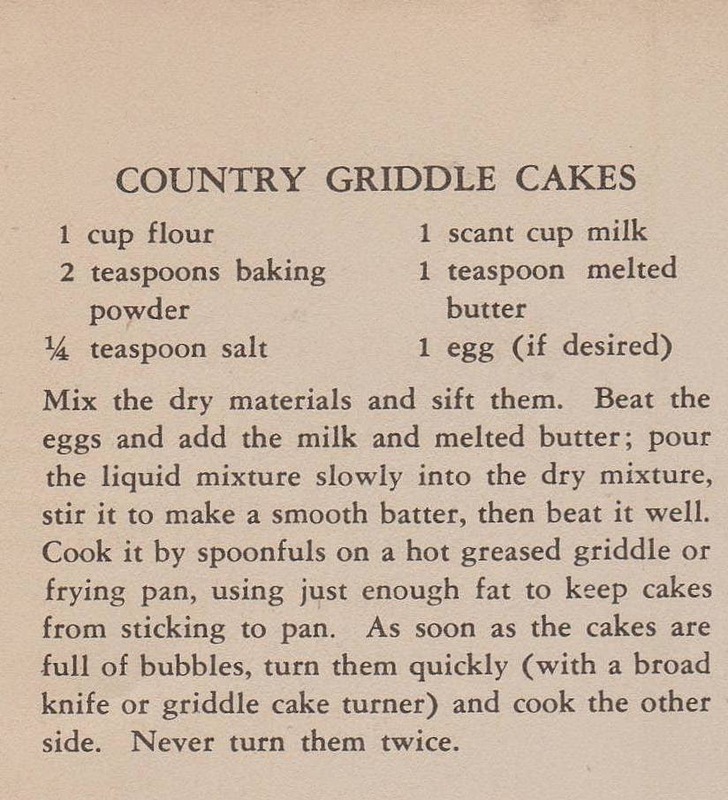 I was looking for a breakfast treat to make the DH for Father's Day this morning and quickly settled on this c. 1935 recipe for country griddle cakes, mostly because I had all the ingredients at hand. 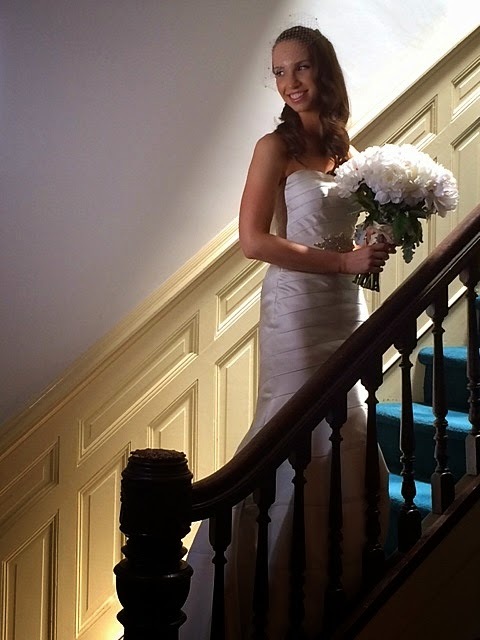 What a great choice! 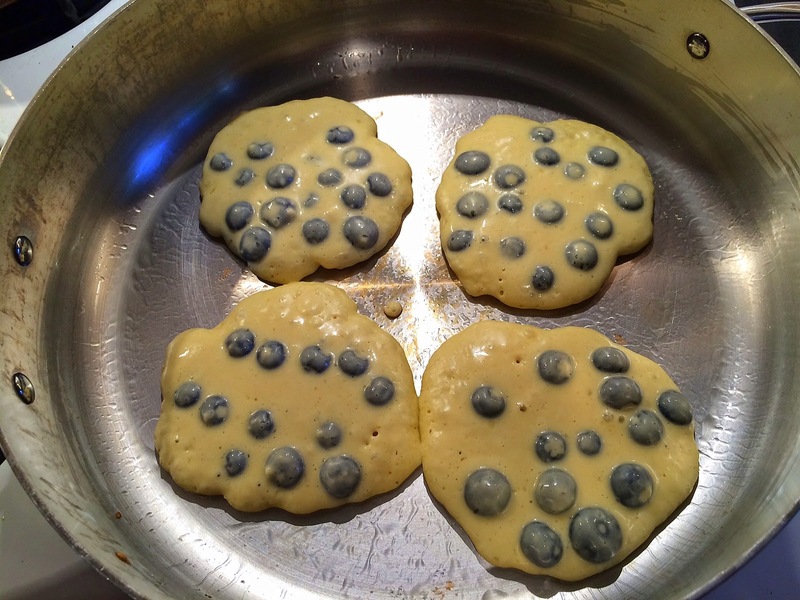 These are very easy, and quite delicious, especially if you throw in a handful or two of blueberries. 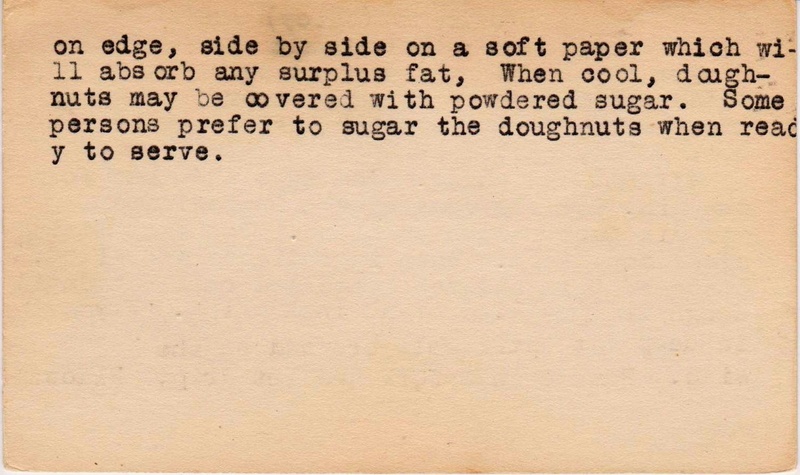 They also contain NO sugar, and very little fat, so they're practically a health food. 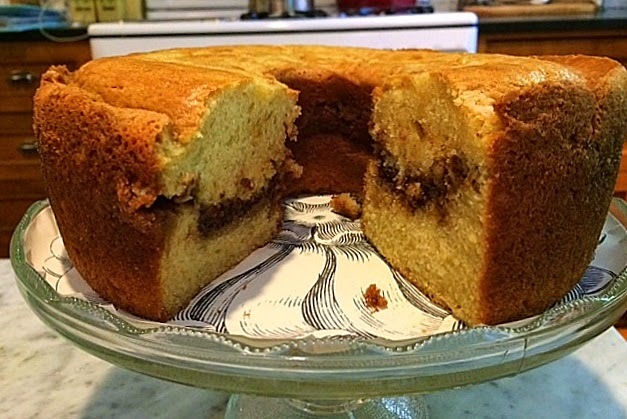 The batter is made with flour, baking powder, salt, milk, butter and an egg. That's it. 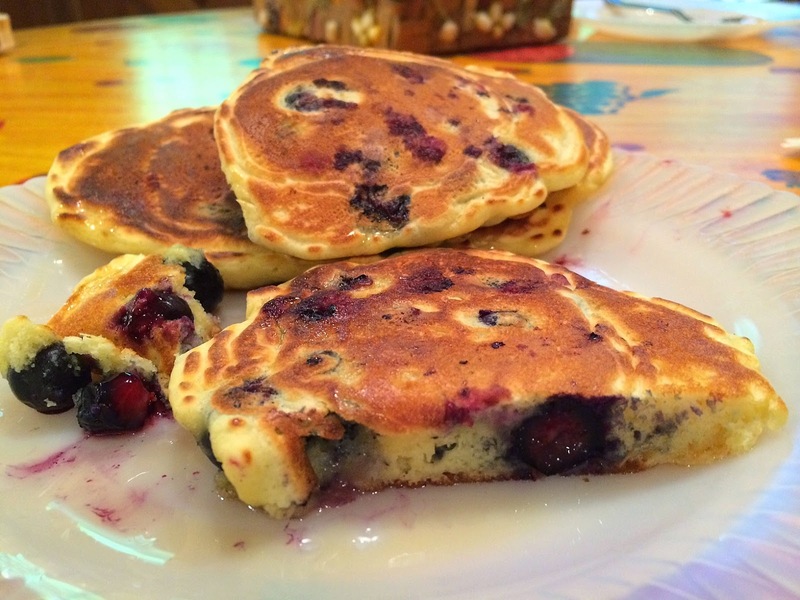 If you have blueberries on hand, just toss them in at the end. It's better to cook these in a low-sided skillet, but I apparently don't have one. They cooked fine in this deeper pan. 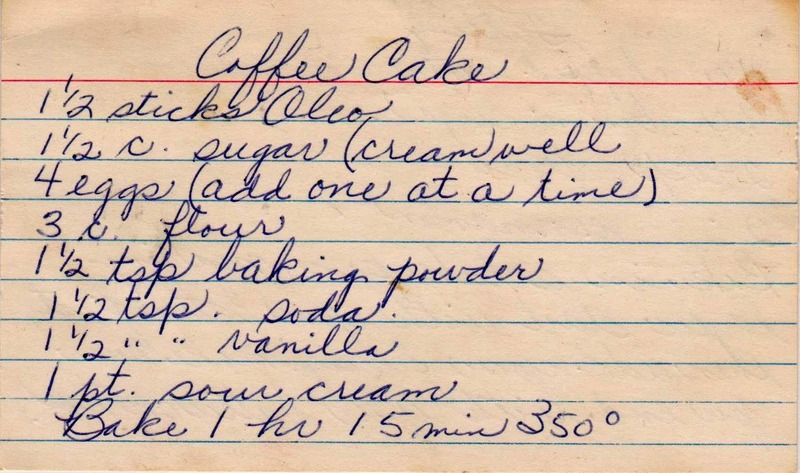 Production notes: I followed this exactly, but used a bit more butter than called for, and I did use an egg. 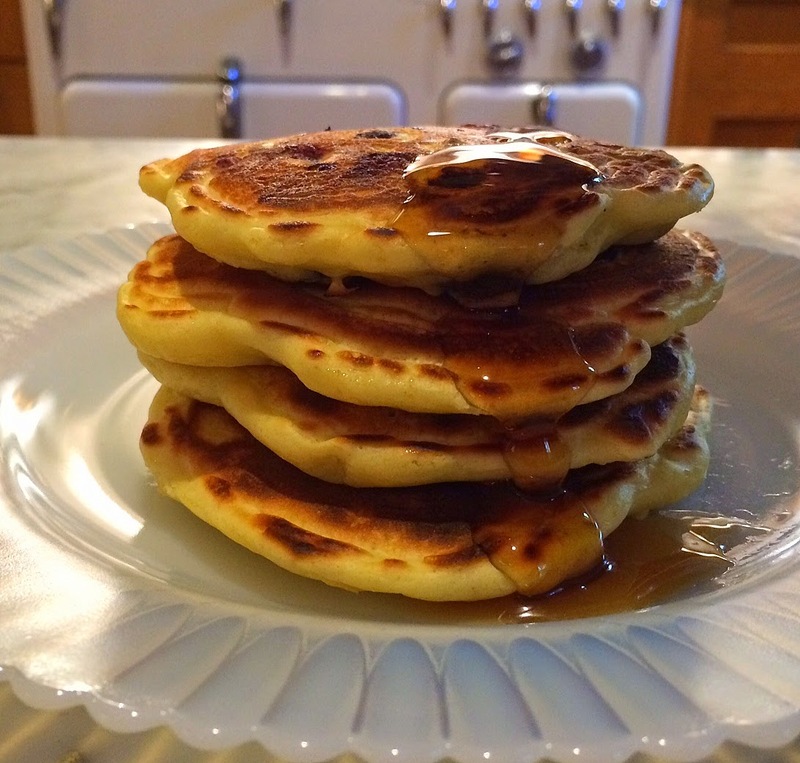 I did not beat the batter well, as called for, because this often results in a tough pancake. 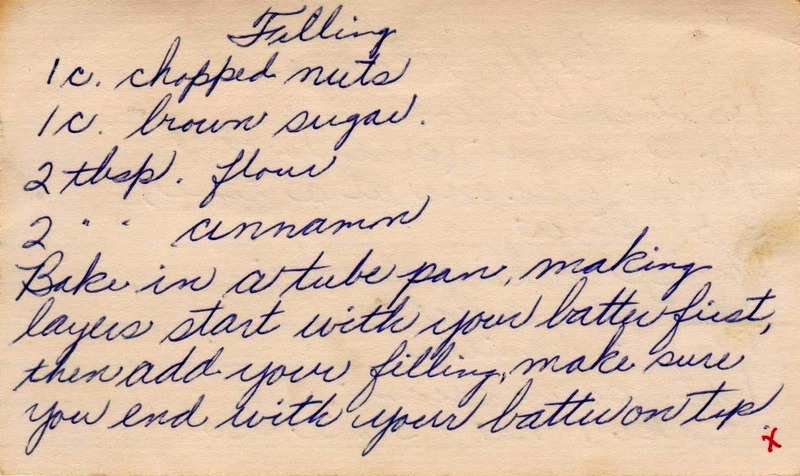 The recipe is from this pamphlet, a gift from my friend Kit many years ago. 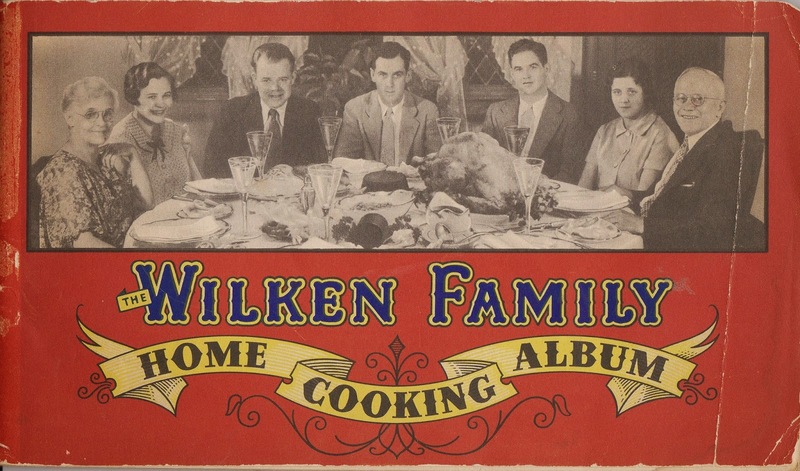 The family was best known for its blended whiskey, which sold in 1933 for just $1 a pint! 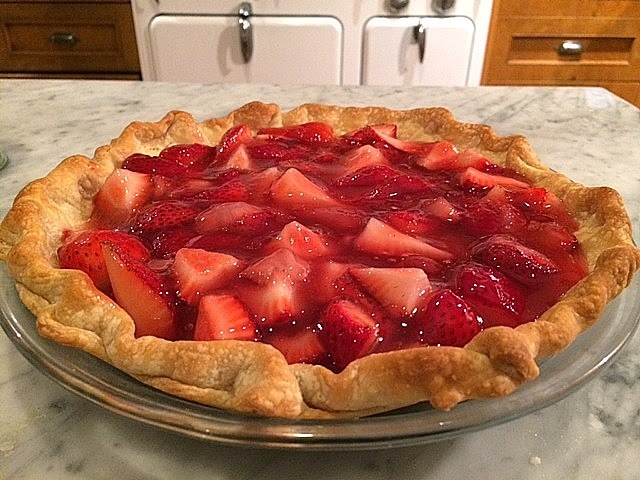 The sweet, fragrant strawberries just now appearing in our local farmer's market inspired me to bake a strawberry pie on Monday night. 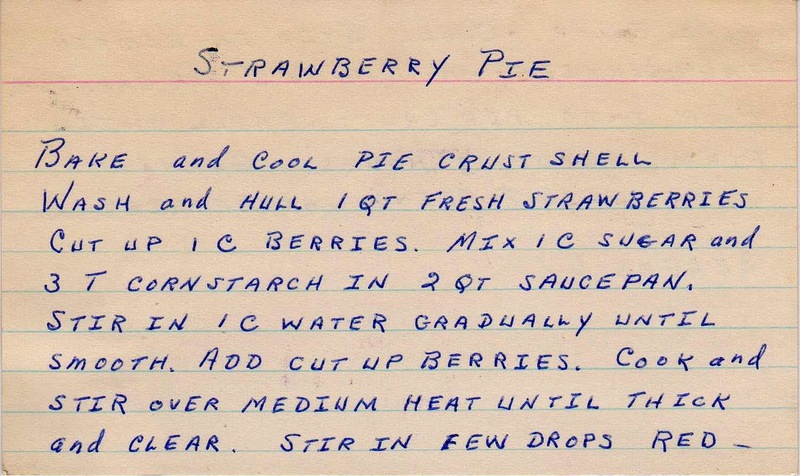 About halfway through, I realized why the pie seemed so familiar -- I had made this very pie in my c. 1971 high school home economics class (and, I recall, we passed the whole thing to some lucky boys waiting outside the first-floor classroom window). 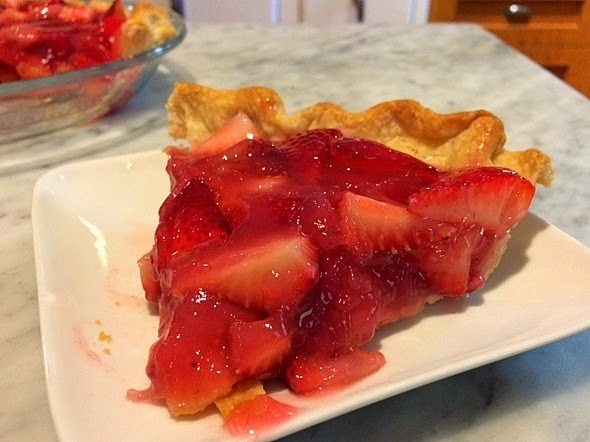 There are two kinds of strawberry pies, the kind where you put the fruit between two crusts and bake, and this kind where the fruit is mixed with a cooked syrup and chilled. 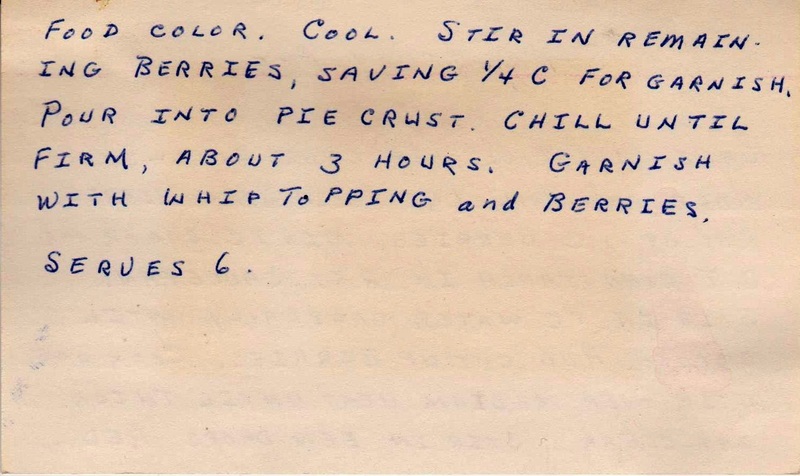 This is a no-bake pie (though you do need to bake the crust), as the filling is cooked, placed in a prebaked crust and refrigerated until set. It's a great way to showcase fruit at its peak. 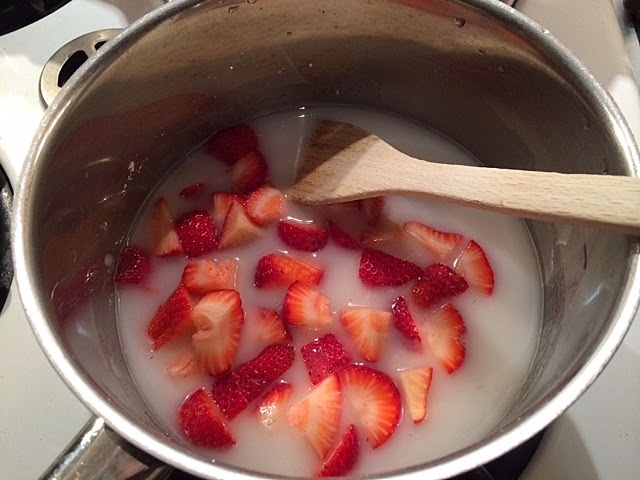 Start by mixing some water, sugar, cornstarch and some of the berries in a saucepan. Cook, stirring constantly, until the liquid is clear. 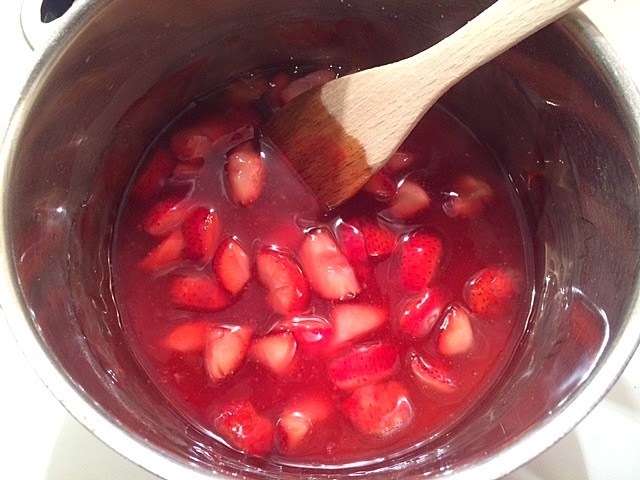 Cool, stir in the remaining berries and pour into the pie shell. Refrigerate until it's set. 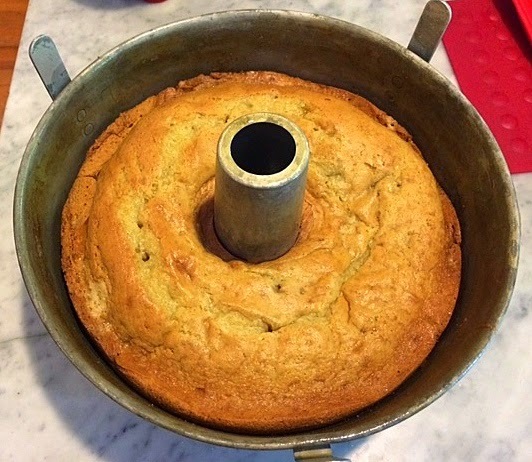 Production notes: I followed the recipe exactly and used an 8-inch pie plate. 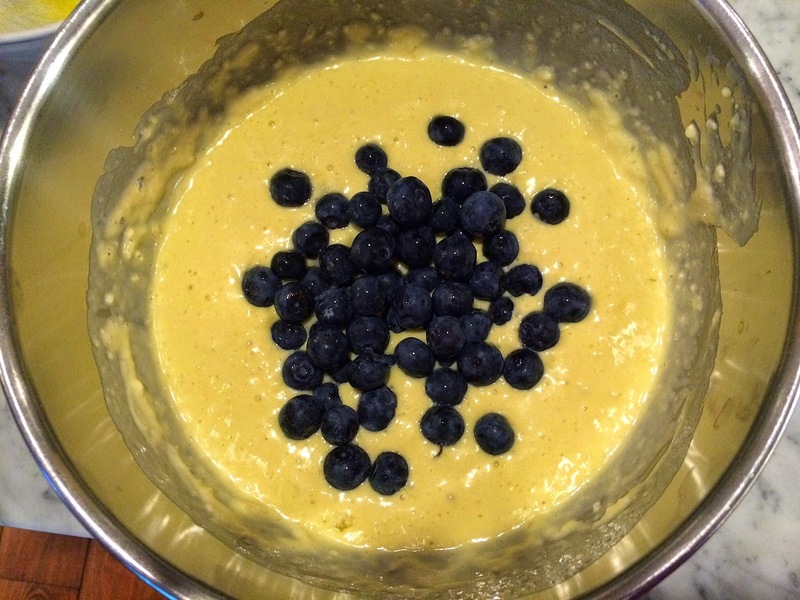 I didn't save any berries for garnish, as I had eaten so many during the pie-making that I had none left.